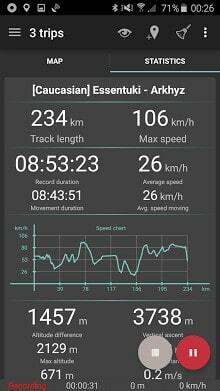 If you’re looking for an excellent gps tracker, if you’re a fan of action sports and long distance travel – this app is for you! – making the reverse journey in an unfamiliar area without getting lost? – tell your friends how to repeat your route? – mark important or interesting points of your trip. The application is able to record, even when switched off. Very long tracks could be recorded without problems – you are limited by storage memory only. Recorded tracks are saved in GPX or KML format, so they can be used in certain applications such as Ozi Explorer or Google Earth. GeoTracker is based on public API of Yandex.Maps, so in trips over Russia and CIS countries you’ll have the most detailed map of the area. If you have a proposal how to enchance the application or faced some problem – please feel free to contact me: me@ilyabogdanovich.com. Thanks! If you have the latest version (3.3.0.1338) you can share stats by clicking on the button share. 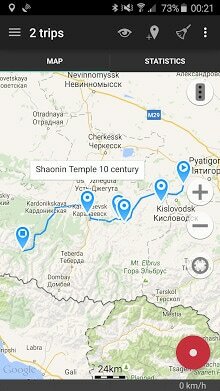 I think map can be shared if you make a screen shot and then post it as an image. P.s. : I love this app but recently I can’t find it on play store anymore!